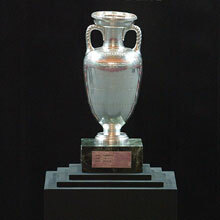 The European Championship is being held every four years and is contested among the national teams of UEFA's members. In these pages you can find a wealth of information about this great sporting event. For the time being the competitions which are covered in detail in this section are Euro 2000, which was held in Belgium and the Netherlands and Euro 2004, which was held in Portugal. Also covered is the preliminary competition of Euro 2008, the final tournament of which be held in Austria and Switzerland. Finally a special section deals with the history of the tournament covering details of all the previous tournaments from 1960 to 1996. Follow the links below for up-to-date information. Back to UEFA Competitions Menu For any comments or suggestions please e-mail to webmaster@takisonline.com Copyright © 1997-2001 Christakis Ioannou. All rights reserved.